According to records of March 1945, 3191 was used by one of the last classes to receive their wings during wartime. Bought by Bert Reynolds in November 1960, MTX remained in the Toronto area until sold to Al McHardy, based at Maple Airport. 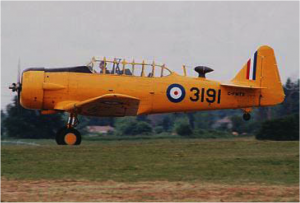 It was later purchased by Stan Castle, then based at the Toronto Island Airport, and was flown as an aerobatic plane at air shows in Ontario. The aircraft moved to King City, Ontario where Norm Beckham saw it and partnered with Bob Hewitt and Len Fallowfield to acquire MTX in 1975. When purchased, MTX was turquoise with black stripes and in 1978 was repainted BCATP yellow. In 1992, it was sold to Jim Goff of Seminole, Oklahoma, but was purchased back at an auction in 1997 and flown to Tillsonburg by Norm Beckham. It was taken offline in 2005 for a full restoration.